Thomas Snella and his national champion. The RoboSlam volunteer team was in full force last Friday, guiding robot builders to victory in the 3rd National Robo Sumo Intervarsity competition. Friday’s RoboSlam and Saturday’s national competition took place during the 2015 BT Young Scientist and Technology Exhibition. At the competition, DIT first year student Thomas Snella (DT066) took the top prize. He will continue on the to European finals. Second place team, also from DIT. 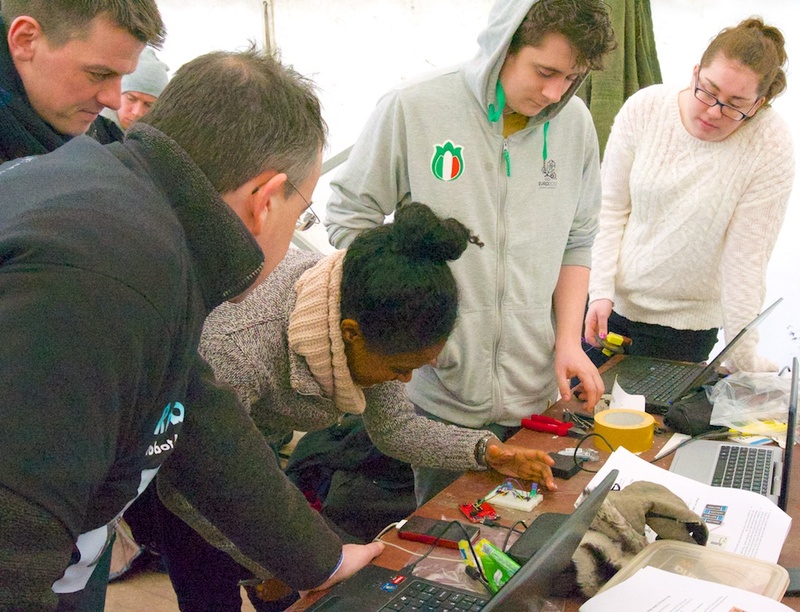 A cross-disciplinary team of DIT engineers of Seamus McLu (DT008), Aoife Redmond (DT009), Samantha Williams (DT021), and David White (DT006) won 2nd place. DIT’s Michael O Meara and Alex Herizon (DT021) made the semi-finals of the competition. DIT students came to the prep day well prepared. 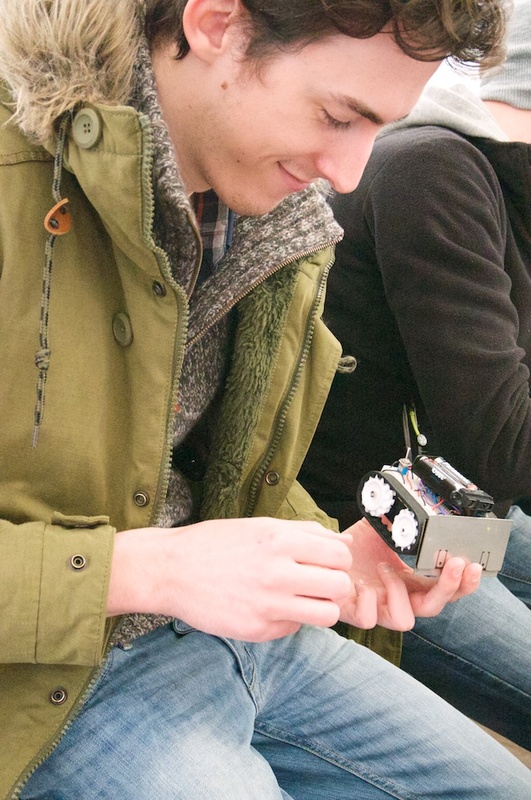 Thomas had designed and built his robot in the autumn as part of the common first year program that all 4-year engineering students at DIT now take. Members of second place team built their robot start-to-finish at our prep event, but they, too, had completed the RoboSumo module at DIT (a year prior). Ruth Coffee and a team of secondary school students. The RoboSlam volunteer team at RDS. One of the highlights of our prep day was that the secondary school students did such a marvelous job constructing their robots. We hope to see them at RoboSlam events again soon! Read more on DIT’s website. Additional photos available on the RoboSlam blog.